I’m honored to receive this awesome review from Feathered Quill Book Reviews! Have you ever wandered into an art show, spotted a ‘modern’ painting, with blobs of color going every which way, and wondered what made it a ‘work of art’? In this delightful story, we see how one fingerpainting found it’s way to a grown-up art show, adorned with a blue ribbon. My Fingerpaint Masterpiece begins in a school art class. Our young protagonist is given a project – use fingerpaint to create something that you see in your imagination. The aspiring artist dabs some green on the paper, then some red, but before the project is complete, the bell rings. The unfinished picture is carefully packed up to bring home, but on the way, a gust of wind speeds by and blows the painting away. Our young artist watches as the painting floats away, high up in the sky. Where will it land? As the wind dies down, the painting gently lands right in front of the local art dealer’s store, The Rainbow Connection. In fact, it didn’t just land in front of the store, but on top of a pile of paintings an artist was gathering together to submit to the store. This artist doesn’t notice the addition to his pile and while the young child would like to see what will happen, it’s about to rain AND it’s dinnertime. Better hurry home! Later that week, Mom and child head to the mall where (surprise!) there’s an art exhibit and what should be prominently displayed but the fingerpainting, matted, framed, and about to receive a blue ribbon! Wow! The reactions of judges and spectators are priceless, with many people trying to figure out the message in the painting. Beauty definitely is in the ‘eye of the beholder’!!! And never got back to my picture that day. 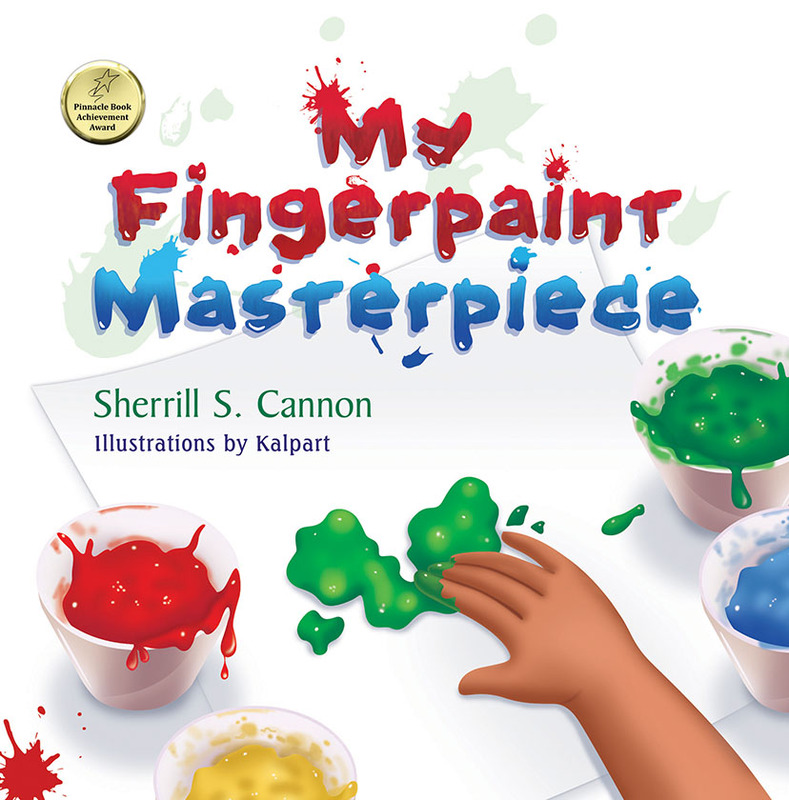 This entry was posted in Art, Children's Picturebook, Fingerpaint, Reviews, Self esteem on July 29, 2014 by Sherrill S. Cannon. The beauty within the eye of the beholder and the beauty of giving. I gave this book to my god daughter as a gift so she could read it to her coming three year old. She and her daughter love it and her little girl has it read to her as a bedtime story. It is a wonderful book for children filled with excellent illustrations by Kalpart done so beautifully to enhance the story. Children should learn about individualism and creating value for themselves and their value system. Something such as a painting can be worth one million dollars in the eyes of other people and one can know what the value is of their work within themselves. Beauty is in the eye of the beholder and knowing what is of value to oneself is the most important learning for young ones. I highly recommend this book and it is wonderful to gift over and over again! This entry was posted in Art, Children's Picturebook, Fingerpaint, Self esteem on July 27, 2014 by Sherrill S. Cannon. The winners of My Fingerpaint Masterpiece seem to be enjoying themselves! to Donalisa Helsley and Wild About Reading!! This entry was posted in Art, Children's Picturebook, Fingerpaint, Self esteem, Uncategorized on July 23, 2014 by Sherrill S. Cannon. Santa’s Birthday Gift is part of a Christmas in July Giveaway by Rockin’ Book Reviews! I am delighted to have a copy of Santa’s Birthday Gift included by Rockin’Book Reviews as part of a Christmas in July Giveaway. There are also two other books included in the Giveaway. Please take a look! Thank you so much for this honor!! 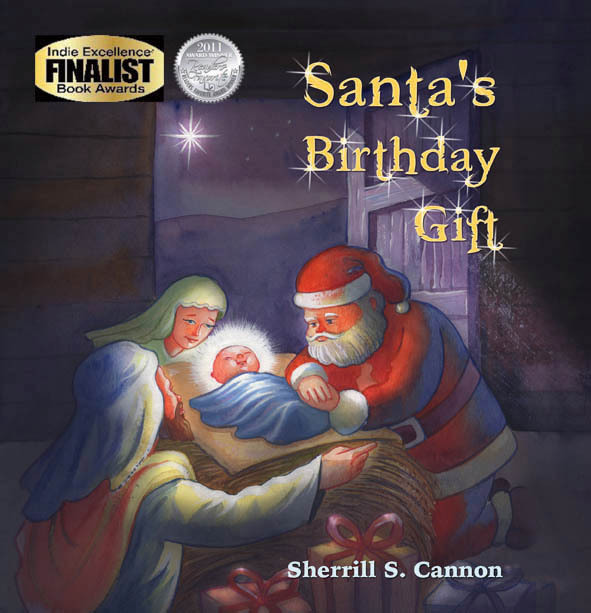 This entry was posted in Children's Picturebook, Christmas, Uncategorized on July 22, 2014 by Sherrill S. Cannon. 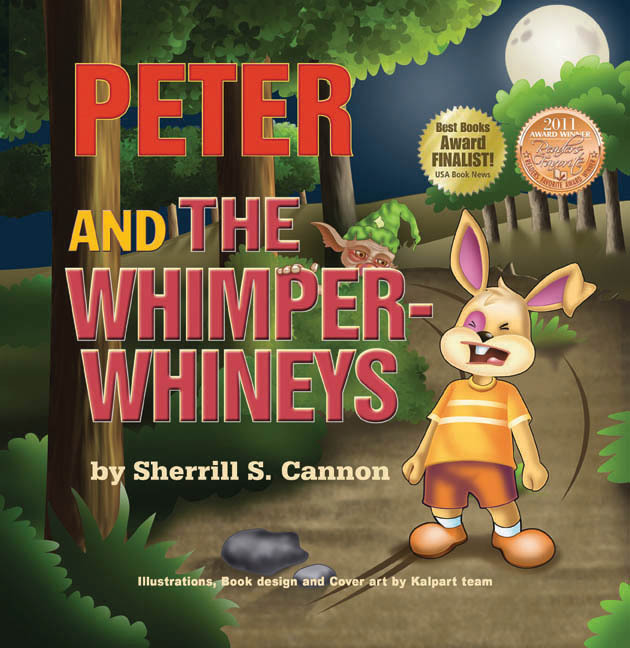 Read-Aloud E-Book uses Peter and the Whimper-Whineys as Demo! iTunes Distribution – using the Peter and the Whimper-Whineys App. The Read-Aloud E-book is an ePub with a fixed-page layout that looks like a book and uses a clickable button to start reading the text on any given page. The Read-Aloud E-book is designed to work on the Apple iPad and is perfect for Children’s picture books. As it reads the text, the words are highlighted to allow children to follow along, making this the perfect learning tool to aid in word recognition and reading development for young children. Apple iTunes Distribution: Getting your eBook converted is only the first step, next comes distribution. We upload your Read-Aloud E-Book directly to the Apple iTunes Store where it can be found and downloaded onto any device running the free iTunes app. This entry was posted in Behavior, Children's Picturebook, eBook, Uncategorized, Whining on July 17, 2014 by Sherrill S. Cannon. Of all the genres you could write, what drew you to writing for children? I have always loved to write rhyming poetry, and I have loved reading rhyming books to children, so writing rhyming books for children seemed perfect! I enjoy the music of the words…and so do the kids! I also try to teach something with my children’s books, disguised as fun stories of course, hoping to promote manners and consideration for others one book at a time! The first published book was Santa’s Birthday Gift, which was a story that came to me in a dream after I had read a story of the Nativity to my granddaughter and she looked at me and asked, “But where’s Santa?” This was the one I wanted to share first. What did you learn after writing your first book that you improved upon in your next books? I learned that I could challenge editing changes! After resisting as much editing as possible with Santa’s Birthday Gift, but afraid to object to the edits too much, I decided to politely decline all but punctuation changes in the next ones. Writing rhyming books is not just about having the words at the end of the lines rhyme…It’s about the meter (or cadence) of the words which has to stay consistent. The stories should have a musical flow, with no “forced rhyme” (twisting the order of the words so that they rhyme at the end of a line.) I also use “slant rhyme” occasionally (like “self” and “help”) in order to maintain the flow of the lines. When did you actually start writing your first book? Many of my books were written several years ago, and then I sent them to the Library of Congress to copyright them, and waited until retirement to try to publish them. How long did it take to write your first draft? Children’s books are not very long, so they don’t take very long to write either! Most of them took less than a day – and then perhaps a little more time to polish them. You’ve now published 6 books and they all deal with teaching a specific message. What do you hope children and parents will take away from your writing? As I mentioned earlier, I am trying to help children learn to be more considerate, to think of others, to have good manners, and to avoid bullying. Self-esteem is very important, but not at the expense of others. I feel that children need to learn respect, and that their behavior should be acceptable to others…all of which can be learned by reading books that boost these values. You are also using these books for fundraising for CureJM and I’m Bully Free. Tell me about them. I discovered the CureJM Foundation when I read a Facebook request from “Addie’s Angels” about a little 7-year old girl with an incurable disease, Juvenile Myositis. I was astounded that in this day and age there was a life-threatening disease affecting our children and no one seemed to be aware of it! My publisher agreed to set up a fundraiser where when purchased through http://sbpra.com/curejm 50% of the cost of the books would go to the CureJM Foundation. Another of the CureJM kids is a teen, Cassandra, who has Juvenile Arthritis as well as several other medical problems. (She is also one of my Junior Reviewers.) She has also been subjected to a lot of bullying, and copied me on a link to the imbullyfree organization. They have now adopted “Manner-Man” as the children’s superhero book, and are planning to include copies in their future programs. 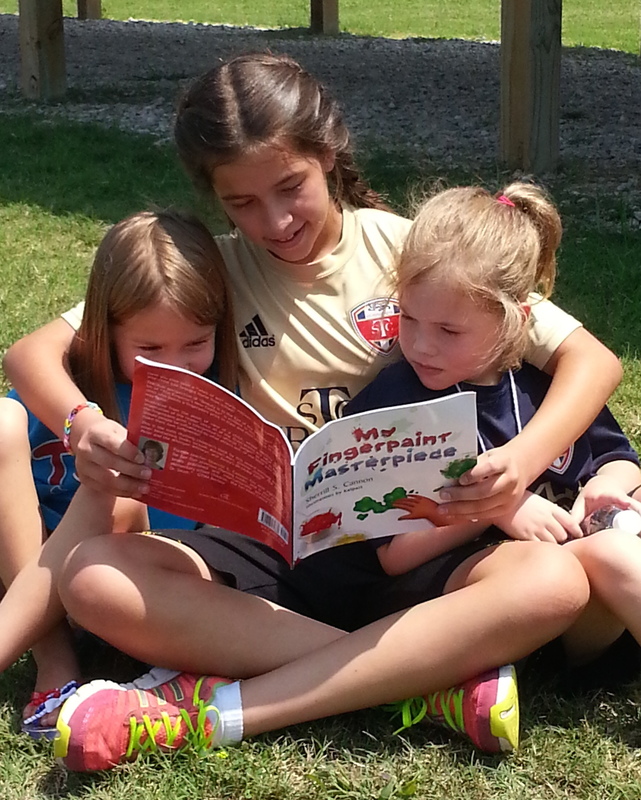 In the meantime, books purchased through http://sbpra.com/imbullyfree have 50% of the cost of the books going to their organization. Prior to writing these children’s books, what was your publishing and writing background? I have quite a few published poems in various poetry book collections, as well as another story published earlier in an anthology. I also have written seven plays for elementary school students that are now published through http://www.lazybeescripts.co.uk and have been performed internationally. So far, in addition to the US, Canada and the UK, they have been performed in Australia, Austria, Botswana, Cambodia, France, Germany, Ireland, Japan, Philippines, Poland, Singapore, Spain and United Arab Emirates!!! Are you active in any writer critique groups? Your bio says you are an award-winning author. Can you give me some background on the two organizations you’ve won multiple awards for? One has to remember that the major awards, ALA, Newbery, Caldecott, etc – as well as SCBWI by the way – will not consider any but traditionally published books. I submit anyway, but know that it’s useless. I enter the ones I consider legitimate and which accept POD books – but never any like the Mom’s Choice Awards with a $300 entry fee! Your publisher, Eloquent Books is a traditional/self-publishing blend where you pay a certain fee and they provide certain services. How much did you research this company before going with it? My publisher is actually Strategic Books Publishing and Rights Agency (SBPRA) although Santa’s Birthday Gift was under its Eloquent Books division at the time of publication. I actually prefer to call it a “Help-Publish” publisher. I realized that I would have to participate in the marketing, but that I would get advice and guidance from the publisher along the way. I researched the company online a little ahead of time. Did you try the traditional route of publishing as well? In the past, I had made a few attempts at sending some queries to the larger publishers, but after the “we do not accept unsolicited manuscripts” from the publishers, and the “we don’t represent unpublished authors” from the literary agents, I decided that I would have faith in my books and would prefer to have readers determine whether or not my books would be popular! What type of promotions does your publisher do on your behalf? What are some of the promotions that you’ve done that have been the most successful? The more success my books have, the more promotions my publisher provides. Opportunities for international sales with the Book Expos all over the world, supportive tweets and postings throughout the social network, as well as positive endorsements. My best promotions have been the success of my books in winning awards! Awards give instant credibility to books, since readers realize the books are worth considering! Today I received notice that as a result of SBPRA participation in BEA14, all six of my titles have been included in “the IB PYP collection of titles and their newest venture “The IB Library” via STUDYeBUDDY. IB PYP stands for “International Baccalaureate Organization Primary Years Programme”. The International Baccalaureate® (IB) was founded in Geneva, Switzerland in 1968 as a non-profit educational foundation. There are currently more than 1,181,000 IB students at 3,776 schools in 147 countries. This curriculum, taught in grades Pre-K through 5 or roughly the ages 3-11, encourages students across the world to become internationally minded, active, compassionate and lifelong learners who strive to understand other people and their cultures. Everything has a global perspective.” How awesome is this??? What has frustrated you the most in putting these books together? What has pleasantly surprised you in the process? No frustrations, since SBPRA accepts my input and respects my judgment. My illustrator for all six books, Kalpart, is awesome and allows me great input. The group is located in India, and it has been fun to communicate through email and scans. I was pleasantly surprised to discover how easily my mental images could translate into illustrations! There is a lot of competition out there now. Lots of celebrities are writing children’s books, and they have clout! My advice to any author is to find your niche and write within your genre. Children need positive messages, and learn what they read. You can’t please everyone, but your book should appeal to as many as possible and have multi-cultural appeal. You want ALL children to enjoy your books! What other books do you currently have in process? I have three manuscripts ready for publication, but I only want to do one book per year. My editor’s daughter, age 10, is currently reading them to determine which one to choose for next year! I always like to get feedback from kids, but of course her Mom will make the final decision. It’s already under contract…whichever it is! Statistics show that many independent authors, unless they do heavy marketing, sell under 100 books. Would you mind sharing your book numbers? At latest royalty report, Santa’s Birthday Gift is over 4000 sold, Peter and the Whimper-Whineys is over 1000, The Magic Word is over 500, with both Gimme-Jimmy and Manner-Man near that, while recently released My Fingerpaint Masterpiece is already over 100 (That is in the order they were released, by the way – one per year since Nov. 2009.) Also, this includes only the print version latest royalty report figures – there are also significant eBook sales. Several are already on the shelves in China and other international catalogs. I’ve read some negative reviews about your publisher. How do you feel about them? SBPRA has been wonderful to me! They care, they reach out, they give wonderful advice – and if your book succeeds, they give 110% to help your book sell. I wish they had been available when I first started writing my stories! Thank you for your insights and your honesty. If you would like to learn more about Sherrill and her writing, here are some links to do that. This entry was posted in Uncategorized on July 17, 2014 by Sherrill S. Cannon. 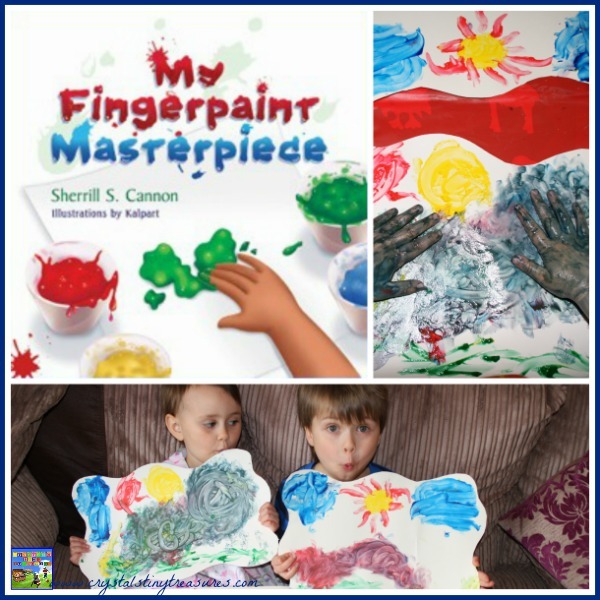 I am pleased to announce that the Midwest Book Review has featured “My Fingerpaint Masterpiece” on the Picturebook Shelf in the July 2014 issue of its review publication, “Children’s Bookwatch”! “My Fingerpaint Masterpiece” is a delightful rhyming story about honesty, character, and creativity, with lots of jokes and hidden surprises in the illustrations and text. One day in art class a child creates an unfinished finger painting while thinking of a scene of his pet dog on the lawn. The unfinished, unsigned painting begins travels of its own on the way home with the child when a wind blows it into the Rainbow Connection Art Gallery where it is framed and hung with other paintings by mistake. Many complications multiply, and finally the unknown fingerpaint masterpiece is awarded first place! The child finally speaks up and tries to take credit for the misunderstood finger painting, no one will believe her/him. This typical reaction is accepted by both child and parents, and the upshot of the story is, a fingerpaint masterpiece by an unnamed artist hangs in the Museum Art Gallery with First Prize award ribbon pinned to it. “My Fingerpaint Masterpiece” is beautifully illustrated and delivered with style. Hidden throughout the illustration pages are images of the author’s other popular children’s books, a witty hello to fans of Ms. Cannon’s juvenile works. An audience of middle elementary students will appreciate “My Fingerpaint Masterpiece” and benefit from its positive message for creative minds of all ages. “The review has been provided to the Helen C. White Library’s “Cooperative Children’s Book Center” (University of Wisconsin, Madison) where it will be made available to school and community librarians throughout Wisconsin’s public school systems and community libraries. This review has also been provided to the Cengage Learning, Gale interactive CD-ROM series “Book Review Index” which is published four times yearly for academic, corporate, and public library systems. Many thanks to the Midwest Book Review for this honor!!! This entry was posted in Art, Behavior, Children's Picturebook, Fingerpaint, Self esteem, Uncategorized on July 16, 2014 by Sherrill S. Cannon.